It’s not uncommon to dread the organizing process and feel paralyzed. 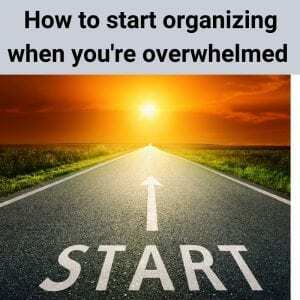 I’m sharing my best tips to help you go from overwhelmed to organized in the next 3 blog posts. Start small. Choose a very tiny area to start, like one drawer, or commit to organizing for a short amount of time (15 minutes every week). Start discarding things that aren’t sentimental. I don’t suggest starting with photos, cards or your kid’s artwork. Your sock drawer might be a better starting point. In other words, look for the low-hanging fruit. Create a location for your donations. A labeled container works well. When you or a family member finds an item to donate, place it into the container. No more confusion about what the bags or piles of things are that you’ve sorted out months ago. You think you’ll remember but as I’ve discovered while working with clients, you won’t. A designated container also works for items you decide to sell. Edit items until they fit within their intended space. If your books have outgrown the bookshelf, donate books until they fit the space once again. Toss stained T-shirts in order to close your T-shirt drawer. Make a decision: Does the item stay or does it go? Shuffling isn’t a decision, it only leads to frustration. Don’t let fear prevent you from moving forward. Ask yourself, what is the worst thing that will happen if I let this go? I once had a client toss all her dirty dishes because she was overwhelmed by the thought of washing them. It was unconventional and a bit startling, but I was happy she made a decision instead of remaining stuck.